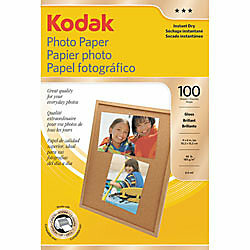 Kodak Photo paper measuring 8 1/2″ x 11″ comes with glossy finish for vibrant colors and is perfect for everyday printing. Kodak Photo paper measuring 8 1/2″ x 11″ comes with glossy finish is ideal for fridge, corkboards, locker prints, school projects and more. Paper comes with 6 ml thickness for the look and feel of a true photograph, sold as 100 per pack.